So here’s a selection of bathrooms for you all to cast your critical eye over. I’d like to think there’s something here to meet all tastes, if not all budgets, but then there’s no point dreaming about a value bathroom suite is there? Charcoal Grey painted walls and black and white photography complement this classic white roll top bath. The wall cladding, unusual street lamps and ‘shabby chic’ furniture add a subtle twist to the classic roll top. 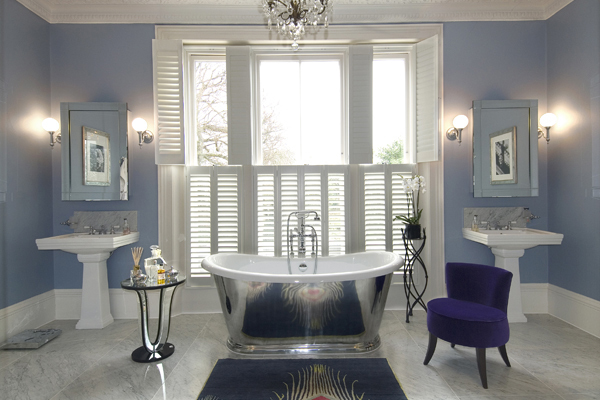 This aluminium ‘bateau’ style bath is stated as lasting a lifetime and benefits from excellent heat retention. This is maybe one for those with a playful sense of humour. 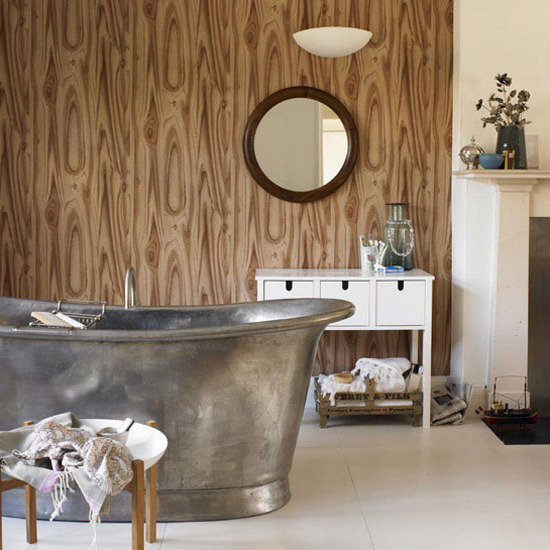 We think the steel bath and wood print wallpaper work together. This ‘disco’ bathroom, as we’ve termed it in HQ, is probably not for the more conservative of tastes. 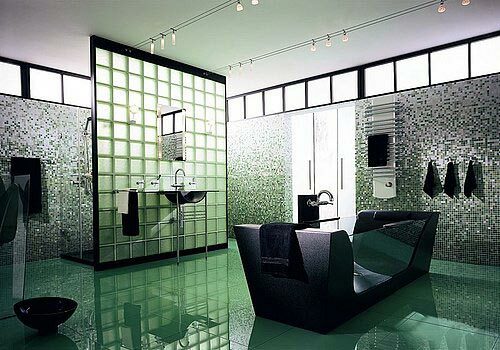 The glass blocks and green tiles certainly give it visual impact! 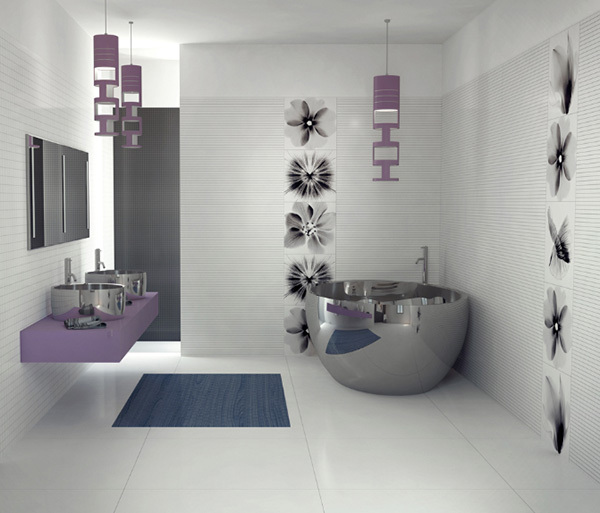 The metallic silver ‘soaker tub’ and basins might be too clinical, were it not for the lilac adding a softer edge. More a plunge pool or hot tub I suppose, but we were taken with it’s simple luxury. OK, so it does help that this one is in a beach house in Phuket, Thailand! 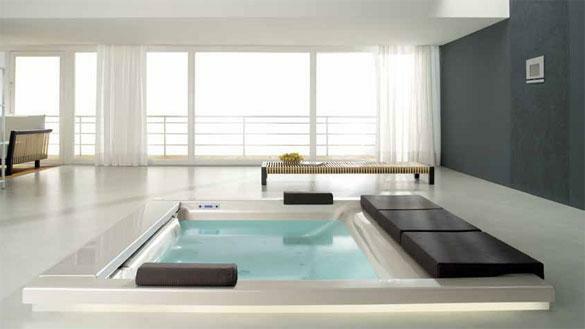 Regardless, we’re loving the luxurious round bath tub. So there we have it, back to the real world for me. I hope there was something there to meet your tastes. If you think you’ve got a better bathroom then please send me a photo to marketing@jacksongrundy.co.uk and we’ll see if we can use it on this blog or on our social media.